Adam’s dissertation project was completed in the Laboratory of Molecular Neurochemistry under the mentorship of Prof. Anita Sidhu, a faculty member in the Department of Biochemistry and Molecular & Cellular Biology at the Georgetown University Medical Center. An ongoing project for Prof. Sidhu’s lab is to better understand the normal, function roles of the synuclein family of proteins in the regulation of neurotransmission, in particular through effects on membrane protein trafficking. The synuclein proteins are believed to participate in many trafficking-dependent processes, including regulation of monoamine signaling through modulation of the monoamine reuptake transporters (1). Adam’s research focused primarily on functional interactions between the synuclein proteins and the dopamine transporter (DAT). This work showed for the first time that all three synuclein family members, including beta-synuclein and gamma-synuclein, participate in modulation of DAT distribution (2). Building upon these findings, he explored a variety of pathways related to protein quality control to further clarify the relationship between the synucleins and transporter trafficking. Most recently, his work showed that synucleins modulate DAT trafficking both directly, through protein-protein interactions, as well as indirectly, by antagonizing export of DAT and similar cargoes from the endoplasmic reticulum (3). In addition to this work, Adam was involved in research projects investigating the role of interactions between the synuclein proteins and Tau in promoting neurodegeneration (4). This included characterization of the relationship between Tau hyperphosphorylation and synuclein-dependent DAT trafficking in models of synucleinopathy, including several alpha-synuclein over-expressing mouse models of Parkinson’s disease (5-9). 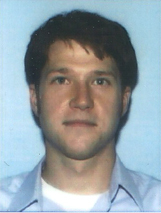 Since graduating in 2013, Adam has taken a position as a Postdoctoral Scientist at George Washington University with Dr. Chiara Manzini where he is continuing his work on neuronal protein trafficking. Dopamine signaling is controlled in part by pre-synaptic re-uptake of dopamine through the dopamine transporter (DAT), and is therefore regulated by the distribution of DAT to the cell surface. DAT trafficking is modulated by the Parkinson’s disease-linked protein alpha-synuclein, but the contribution of synuclein family members beta-synuclein and gamma-synuclein to DAT trafficking is unknown. Here, both animal and cellular models of DAT trafficking have been used to examine the role of the synucleins in modulation of DAT. Over-expression of A53T mutant human alpha-synuclein is among the most successful transgenic models of Parkinson’s disease, producing accumulation of A53T alpha-synuclein that causes adult mice to develop severe motor impairment resulting in early death at 8-12 months of age. Altered motor activity and anxiety-like behaviors have also been reported in pre-symptomatic animals. An analysis over the adult life-span of motor activity, anxiety-like, and depressive-like behaviors identified perturbations both before and after the onset of disease. While membrane distribution of DAT was elevated in young A53T mice, DAT function was normalized with aging, and was associated with accumulation of the synuclein proteins, activation of Tau kinases, and hyperphosphorylation of Tau. Substantia nigra pars compacta neuron counts were reduced in aged A53T mice, yet striatal medium spiny neuron dendritic spine density was maintained, suggesting that compensatory modulation of DAT by beta-synuclein and gamma-synuclein helped to preserve striatal function. To explore the mechanisms enabling synuclein modulation of DAT, the effect of each synuclein on DAT distribution was examined in SH-SY5Y human neuroblastoma cells. These studies showed that all three synucleins negatively regulated cell surface distribution of DAT and limited export of DAT from the endoplasmic reticulum (ER). These effects were associated with impairment of the ER-Golgi transition and entry of the synucleins into the ER lumen. It was shown that the synucleins bound to and altered the activity of ER resident heat shock chaperone Grp78 (78 kDa glucose-regulated protein), a critical regulator of ER function. This suggests a mechanism for regulation of export of DAT and similar cargoes by the extended synuclein family through multiple parallel impacts on cellular trafficking and the secretory pathway. 3. Oaks, A. W., Sidhu, A. 2014. Parallel mechanisms for direct and indirect membrane protein trafficking by synucleins. Communicative and Integrative Biology, 7:e26794.